I actually enjoy playing around with beta code, because I like getting a peek at where things are headed. I also enjoy hitting the ground running, when the final product finally arrives. For over a decade now, in my home the family's PCs tend to be at the very latest OS level, usually a month or two before generally available. 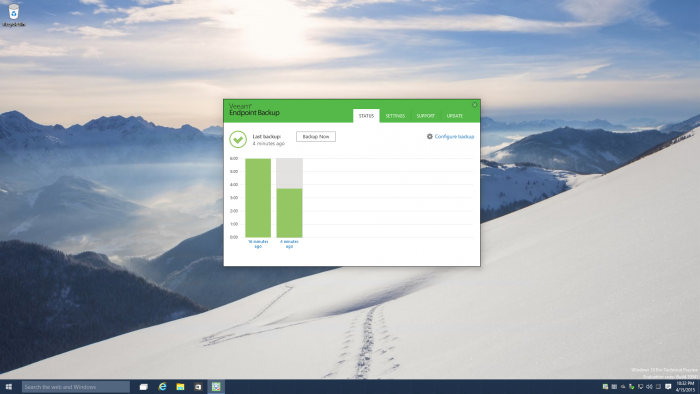 So it's fun for me to share with you the secret sauce I used to "convince" Veeam Endpoint Backup FREE into letting me use it with Windows 10 Pro Technical Preview Build 10041. Once I made the right installation tweaks, everything just worked flawlessly and quickly, even on a modest 8-year-old T61 laptop with a SATA2 SSD. Yes, Windows 10 is currently beta. Yes, this "hack" is not a permanent solution for anything you'd use for stuff that really matters to you. It's mostly just horsing around, which for me also means learning the product inside out. I knew this could work, because it already worked on earlier beta versions of Endpoint, as I demonstrated here. So then it just became a matter of how to make it work, despite the apparent installer show-stopper. Do not open a service ticket from within the friendly Endpoint UI if you're running this on Windows 10. A functioning system (physical or virtual) with Windows 10 Pro Technical Preview Build 10041 installed. Below, you'll find a detailed walk-through video that demonstrates every step of how I did this, followed by some fairly extensive tests to verify functionality. Disclosure: Veeam has been an advertiser on many virtualization sites for years now, and Veeam is currently running a BuySellAds-purchased advertisement along the top of TinkerTry as well. All TinkerTry advertisement goes through third party BuySellAds. 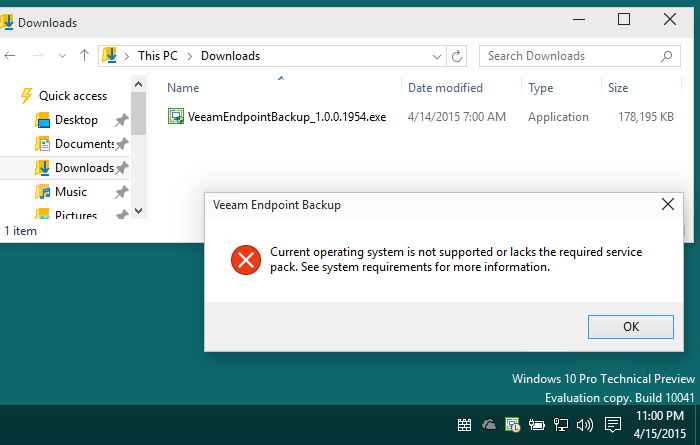 None of my articles are sponsored posts, and note that there are currently no affiliate links for Veeam Endpoint Backup FREE, or any of their other products. TinkerTry.com, LLC is not a Veeam Pro Partner. There are no commissions for any Veeam products folks buy after reading one of my articles. I reserve the right to freely write about topics that I choose, whenever I choose to, an essential part of what makes blogging about home virtualization labs, storage, and backup so much fun. TinkerTry - Sensible datacenter technology in the IT Pro's home. My opinions here, not my employer's. Paul Braren, VCP #2681 in 2005, vExpert 2014-2019, vExpert vSAN. Emphasis is on home test labs, not production environments. No free technical support is implied or promised, and all best-effort advice volunteered by the author or commenters are on a use-at-your-own risk basis. Properly caring for your data is your responsibility. TinkerTry bears no responsibility for data loss. It is up to you to follow all local laws and software EULAs. Short excerpts of up to 150 words may be used without prior authorization if the source is clearly indicated. This means you must include both the original TinkerTry author's name, and a direct link to the source article at TinkerTry. © 2011-2019 TinkerTry.com, LLC all rights reserved. TinkerTry.com, LLC is an independent site, has no sponsored posts, and all ads are run through 3rd party BuySellAds. All editorial content is controlled by the author, not the advertisers or affiliates. All equipment and software is purchased for long-term productive use, with any rare exceptions clearly noted. TinkerTry.com, LLC is a participant in the Amazon Services LLC Associates Program, an affiliate advertising program designed to provide a means for TinkerTry to earn fees by linking to Amazon.com and affiliated sites. These revenues help show your support by helping fund the production of quality content, at no cost to you. Other shopping links featured in the articles may be from Skimlinks, Digital River/OneNetworkDirect, or Commision Junction affiliate programs, and could also result in small commissions for purchases. Many content creators will find Skimlinks a convenient way to commoditize high-value content, with little effort. See also Skimlinks Disclosure and FTC Guidelines. If you're interested in automatic Skimlinks to help cover the cost of running your site, consider using this referral URL.